Innovation Platform (IP) members across three regions in India met and explored opportunities of convergence to upscale innovations. Some concrete opportunities were identified in the areas of climate-smart interventions; short duration crops/cultivars; harnessing green and blue water for agriculture; and convergence to promote sustainable intensification of arid farming. There are 15 action sites in the three states of Rajasthan, Karnataka and Andhra Pradesh. At each of the meetings in the three states, the project progress at the respective action sites were shared, feedback obtained and opportunities of convergence to upscale innovations were explored. Based on last year’s results and stakeholders’ experience, different interventions were planned (or existing interventions modified) by project partners, in convergence with the line departments. and blue water for agriculture. The Joint Directors of Agriculture, at Bijapur and Anantapur, sought continuous engagement with the programs for upscaling climate smart innovations. Rajasthan Seeds Corporation and the Department of Agriculture and Horticulture, proposed specific activities on seed production, water harvesting and agro-horticulture as part of the integrated farming system in Jodhpur, Barmer and Jaisalmer districts. Besides cultivation of Shankhpushi (a medicinal plant), other medicinal plants like Jeevanti and Arna were also identified to be cultivated, based on the feedback from Dabur India Ltd, a company specializing in manufacturing herbal medicines. The Divisional Commissioner, representing five districts of western Rajasthan, committed cooperation on behalf of all line departments in the State. As part of the IP, a multi-disciplinary systems approach is followed to promote sustainable natural resource management, appropriate crop-tree-livestock integration and institutional innovations across value chains to build farm systems’ resilience and sustainable intensification at the village level. The IPs have successfully helped sensitize relevant stakeholders on benefits of convergence and on harnessing synergies in implementing interventions to improve farm-based livelihoods and ecosystems services. During May-June period three such IP meetings were organized, one at each of the project regions with participation of over 200 stakeholders representing diverse sectors. Innovation platform (IP) is a unique approach bringing together stakeholders from across a wide range of sectors along the value chain, with complementing objectives and interests. 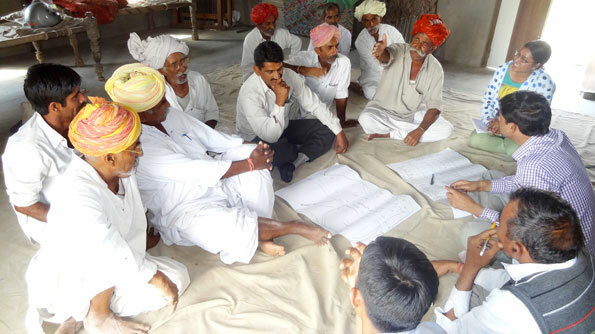 It helps them to collectively address common challenges and opportunities and give a boost to dryland agriculture. The stakeholders include a mix from the farming communities, national research and extension systems, policy-makers, international organizations, research institutes, non-governmental organizations, and the private sector. The IP provides a forum to identify the needs and test various options to address the needs through adoption of policy, technologies, and other innovations intended to improve food security and livelihoods in dryland systems. This approach has been recognized as an effective strategy for enhancing systems resilience and sustainable agricultural intensification in dry and marginal areas. Partners: CGIAR centers (ICRISAT, International Centre for Agricultural Research in the Dry Areas, International Water Management Institute, International Livestock Research Institute, Bioversity, International Potato Centre), national research institutes (Central Arid Zone Research Institute, Central Research Institute for Dryland Agriculture, Arid Forestry Research Institute, state remote sensing center), state agricultural universities (University of Agricultural Sciences Dharwad, Bijapur; Acharya NG Ranga Agricultural University, Anantapur), Non-Governmental Organizations (Gramin Vikas Vigyan Samiti, CORUS, Rupayan Social Development Society, SBMMAS), Krishi Vigyan Kendras (Barmer, Jodhpur), Industry (Dabur India Ltd), state line departments and farmers. To build the capacity of consortium partners a training workshop on ‘Agro-ecosystem Development and Management (AeDM) for Building Climate Resilient Communities’ was held recently. Based on the Bhoochetana project principles, ICRISAT is implementing the ‘Yamang Lupa’ project in Philippines in collaboration with the Bureau of Agricultural Research (BAR) and Bureau of Soils and Water Management (BSWM). Thirty two trainees participated in the training. A team of experts from ICRISAT comprising of Dr Junel Soriano, Visiting Scientist; Dr KV Raju, Principal Scientist; Dr AVR Kesava Rao, Scientist and Dr Kaushal K Garg, Senior Scientist, delivered the sessions and conducted group discussions along with experts from Philippines. Ms Emily Victorio, Senior Agriculturist of the Bureau of Animal Industry (BAI) discussed crop-tree-livestock integration to agro-ecosystem and Mr Jose Manguerra, Supervising Agriculturist of BSWM, gave the overview of watershed development in Philippines. 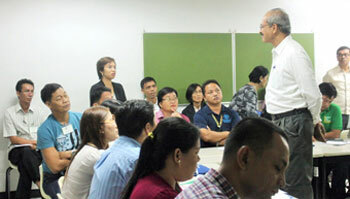 The training was held during 23-25 June, at DA-BSWM, Quezon City, Philippines. To enable smallholder farmers in the Indian state of Odisha move up the value chain by becoming producers of Certified Seed (CS), training programs were conducted in four villages. Farmers were trained to undertake quality seed production of a high-yielding groundnut variety, ICGV 91114 (locally known as Devi) with certification from authorized agencies; production practices to raise a good crop that included: land preparation, seed treatment, sowing, weed and water management, integrated nutrient, pest and disease management, appropriate time of gypsum application and harvest, and post-harvest handling of the produce. Besides they were also made aware of important diagnostic features of Devi variety, so that farmers can remove the off-types to maintain genetic purity of the seed. During the training program, about 32 tons of Foundation Seed (FS) of Devi variety was distributed to the farmers to take up CS production in the districts of Kalahandi, Nuapada and Bolangir. These farmers will undertake the CS production in about 218 ha, during 2015 rainy season. Also, about 3.6 tons of Breeder Seed from Odisha University of Agriculture and Technology was supplied to some farmers to take up FS production. The project was initiated to introduce high-yielding groundnut varieties and expand the area under cultivation by developing village-level seed production models to meet the seed requirements of postrainy season groundnut cultivation in Odisha. Due to low seed multiplication ratio and its bulky nature, private agencies are not interested in groundnut seed production. Hence, to meet the seed requirement, the project envisages production of 750 tons of certified groundnut seeds every year in 2015-16, 2016-17 and 2017-18 through the seed farmers. Besides low inputs and rainfed cultivation in marginal lands, the most important reason for low production of groundnut has been the non-availability of seeds for the high yielding varieties of groundnut. Farmers in the state continue to use low-yielding obsolete groundnut varieties like TMV 2, JL 24 and AK 12-24. ICGV 91114 (Devi), a drought tolerant short-duration variety, was identified as a farmer preferred variety under an IFAD-supported grant and released for cultivation in 2008 in Odisha. At that point, as seeds were not available to farmers due to the lack of a seed production system in place, there was no uptake of the variety by the farmers. To rectify the situation, and make available this variety to the farmers, the project partners initiated a plan to encourage local farmers to become producers of certified seeds. Various classes of certified quality seeds produced by these ‘seed producers’ will be directly procured by the Odisha State Seeds Corporation and reintroduced into the seed production chain. To maintain the ‘variety pipeline’, large-scale demonstrations of two new pipeline varieties, ICGV 02266 and ICGV 00351, and 30 sets of farmer participatory trials are underway during the current season. 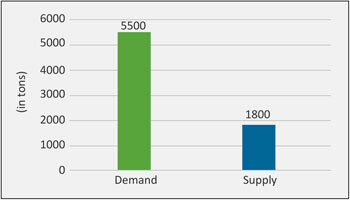 ICGV 00351 was recently released in Tamil Nadu and is performing well in Karnataka as well. About 600 farmers, including 160 women farmers, attended the training programs that were conducted from 29 June to 2 July in the four villages, Khariar (Nuapada district), Lebada (Bolangir district), and Mermahal and Bhawanipatna (Kalahandi district). 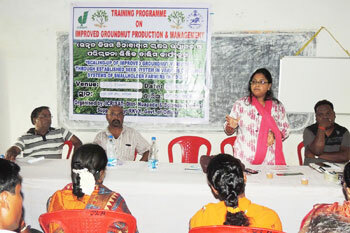 DY Giri, Senior Technical Officer, Groundnut Breeding ICRISAT, Mr Sharatkumar Tripathy, State Coordinator, Odisha Project along with officials of Department of Agriculture, imparted the training. Partners: Department of Agriculture, Govt. 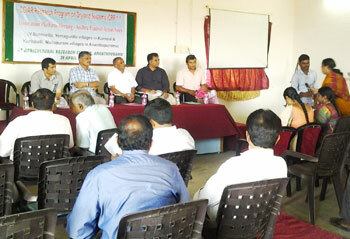 of Odisha; National Seeds Corporation; Odisha State Seeds Corporation; Odisha University of Agriculture and Technology; ICRISAT; farmer self-help groups and farmers. About 1,000 smallholder farmers/caregivers received training on agronomy of groundnut cultivation, technology transfer and obtained improved seed variety from ICRISAT, while the Women Farmer Advancement Network (WOFAN) provided fertilizer for the pilot project which will focus on both rainfed and dry season groundnut production. A follow-up training on groundnut oil processing using locally fabricated manual and motorized machines would be held during the season. This is expected to assist the caregivers increase family income and nutrition and give basic care in return to the orphans and their families. A total of 400 packs (10 kg each) of groundnut seed (to be planted as demonstration plot for seed production as well as compare with local cultivars), 1,000 packs (10 kg each) of maize seed and 1,000 packs (10 kg each) of NPK fertilizer was distributed to the participants. Another set of 308 packs (1 kg each) and 132 packs (10 kg each) was distributed among 22 wards. In an advocacy visit to the district headquarters where distribution of input and fertilizer took place on 10 July, Dr Hakeem Ajeigbe, ICRISAT Nigeria Country Representative and Ms Hajia Salamatu Garba, Executive Director of WOFAN explained to the District Head of Gwarzo, Mr Alh Shehu K Bayero and the community about the various projects undertaken by ICRISAT and WOFAN on agriculture, health, nutrition and income generation. Mr Alh Bayero thanked ICRISAT and WOFAN and promised to support the activities justifying that the concept of training the caregivers and orphans is very important and timely since they can use the knowledge gained to generate more income instead of depending on alms.